Protect walls and equipment from bumps, dents, scraps, and abrasions with our wide selection of doughnut, corner or strip bumpers. Ideal for installation on casters of carts, platform trucks, shelving and more. Click here to download the complete selection of Bumpers by Jarvis and Darnell-Rose. A-813 Doughnut Commonly installed on the ends of tubular handles to give needed protection in manipulation of equipment. Note steel insert. 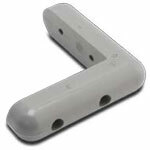 Attached to wood with wood screws or to metal with rivets, bolts or metal screws. Weight: 6 oz. each. 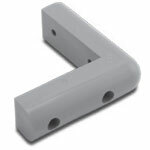 Gray end bumper generally used on the ends of tubular handles on carts and platform trucks. Designed to help protect equipment as well as walls and door facings. Bumper Dimensions: 3-1/4” diameter with steel insert for 5/16” mounting bolt. 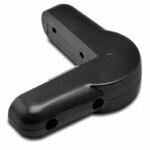 Black end bumper generally used on the ends of tubular handles on carts and platform trucks. Designed to help protect equipment as well as walls and door facings. Bumper Dimensions: 3-1/4” diameter with steel insert for 5/16” mounting bolt. Designed to fit over 1” OD square tubing on carts and a variety of rolling equipment. Please specify round or square tubing when ordering. Specify B-3-1/2 R for round ID and B-3-1/2 S for square ID. 5” diameter rolling bumper; tapered grey rubber bonded to zinc plated insert with removable center bushings to fit stem diameters from 3/8” to 1-1/8”. Specify bumper B-5. Made to give adequate protection to all surfaces that may be contacted, such as doors, doorfacings, walls, furniture and other equipment. Easily attached by using self-tapping sheet metal screws. Weight: 6 oz. each. Made especially for use with A-567 Strip Bumper, giving a uniform continuous effect all around the equipment. Weight: 5 oz. each. Made especially for use with A-1541 Strip Bumper, giving a uniform continuous effect all around the equipment. Weight: 5 oz. each. Grey or black corner bumper for mounting on the corners of equipment, carts or any flat surfaces. Absorbs shock to protect equipment and walls, doors and furniture. Bumper Dimensions: 7/8” thick x 1” high x 2-5/8” long from inside corner on each side. A heavy duty bumper with reinforced, rounded corner to protect equipment from shocks and bumps. Steel inserts inside bumper assures permanent mounting to equipment. Ends are tapered and rounded for added design appeal. Bumper Dimensions: 1” thick x 1-1/16” high x 3-1/16” long from inside corner on each side. Mounting holes are 13/64” diameter. A common bumper used to protect a wide variety of mobile equipment and the surrounding environment from bumps and scrapes. This bumper is equipped with steel inserts and can be mounted on any flat surface. The ends of the bumper legs may be cut at notched area to make square ends. Bumper features steel inserts. Bumper Dimensions: 7/8” thick x 1” high x 3-1/8” long from inside corner on each side. Grey bumper with no steel insert, order model number 4724-30. Molded strip corner bumper 12" long, for application to any right angle shape. Easily installed with self-tapping metal screws. Weight: 8 oz. each.